It was a shake of the shoulders to hear that only a few short decades ago, initial teacher training courses would actively seek to ‘decolonise’ mindsets before sending wide-eyed new educationalists into the classroom. We discussed the now lost intention of ITT of old to delineate the socio-cultural contexts framing education with a view to perhaps dismantling them, for the benefit of students. Now, with such rapid routes into teaching and very little thinking time before hitting the chalk face, the moment of reflection in which teachers can challenge the paradigms steering their professional existence has been diminished, almost to nil. Are we even aware of the colonial bent affecting our contemporary thinking? At one point someone raised the point that in this digital age we have a very visible, very updatable forum for shared memory and accountability via social media channels such as YouTube (particularly the comments) and twitter. The relevance? That new forms of expression are held to account with a scrutiny and immediacy that we, as a species, have not experienced to date. This got me thinking. So much of what we study has been cauterised and shaped and managed and moulded into a solidified history that purports to be objectively ‘true’, that it goes unchallenged. The digital age has revolutionised this, inasfar as cultural artefacts are scrutinised, and criticised with an existing record in a democratised sphere. Do we challenge pre-modern art in this way? The curriculum samples from a narrow field of thought, values and ideals and suffers from confirmation bias over time. This means that students become ‘shrink wrapped’, hermetically sealed from new ways of thinking about old things, or new things entirely. Even the existence of a curriculum that implicitly suggests that the best of all there is is what has been selected and studied is deeply problematic. Educators have a responsibility to encourage porous students who are receptive to new ideas and challenging thought, otherwise we risk confirming the confirmed rather than encouraging genuine insight. How can we make a very shrink wrapped curriculum an opportunity for permeability, when the pressures are to close the conversation rather than open it up? Education is being commodified with increasing frequency. Just consider the unending stream of bumf hitting heads of departments’ pigeon holes, selling educational solutions at a price. During my own prevention I offered the idea that we ‘dance to a neoliberal groove’, by which I mean that the purpose of formal education is still to satisfy capitalist urges. Get kids the skills and knowledge they need to prosper, or prop a system that benefits others. This perspective has bled into the delivery of education itself, with private companies such as Ark and Harris being given the remit to establish schools out of proven business models. Where pedagogic integrity sits in all this is open for debate. The educational landscape must be interrogated in this manner to avoid blind reinforcement of ideas we didn’t create in the first place. In my talk, I referenced Hirsch as a huge influence on our educational ideas, with the whole ‘knowledge as power’ approach steering our educational drive. When notoriously political artist Ai Wei Wei used mangled iron rods to make comment on the state’s attitude to natural disaster and tragic loss of life, he spoke to audiences in a new unfamiliar language, offering cryptic, elusive codes that created dissonance and asked for new thinking. Saying something in the same way it has been said before offers recognisability and ease of understanding, but this can be at the expense of useful frictions. As educators, which ‘languages’ have we been given? How can we create useful dissonance and friction for students to interrogate received knowledge (steered by aforementioned contexts)? It’s nothing new that the curriculum tells a singular, predominantly monochrome, heavily gendered story, but seeing the texts that constitute the KS3 and 4 curriculum in black and white was a cold reminder of Dead White Man model of literary education that we continue to run. More illuminating was the discussion surrounding the Enlightenment. An argument proposed was that this period of ‘enlightened’ thinking was actually born from a need to inoculate certain cultural ideals into a generation of privileged elite who were poised to go globe-trotting – an endeavour that risks irreparable cultural damage. The result? Cultural ideals define what is considered important, confirmed and reconfirmed every time we dust off the canon and turn pages on ‘the classics’. For educators, especially ones entering a scholarly heritage, it is imperative to stop confusing intellectual identity with cultural elite. Here, I was introduced to the work of Lisa Jardine, who has interrogated the Renaissance and asked questions of how this period reflected hierarchies in status and control. Whose story are we telling? Are there any tokenistic nods to diversity? What do they suggest about the single story? There’s an intimidatingly long German word I have never come across before that will forever affect my attitude towards progressivism in education. Reformpadagogik. As educators, we need to be hyper-sensitive to perceived societal and cultural needs, specifically the gaps between these needs and existing arrangements. In short, if the curriculum is not fit for actual purposes, there is a problem that needs to be addressed. I loved this definition, complete with an all-important hyphen. Western educational systems are guilty of returning to the same cycles of thought that promote the same hieracrchal structures. This re-cycling can confirm problematic hierarchies. The irony is that many of the most revered thinkers in popular English intellectualism actively break the cycle and operate in slippage and code switching, eg: Shakespeare, Stephen Fry, Monty Python. For depth and integrity. Knowledge of the original contexts for a particular idea, thought or artefact is as important as appreciation of that idea, though or artefact. Not only because you might miss some of the depth linked to the original source material, but because you will not be aware of what has been lost. Seeing examples of poor artistic appropriation / theft in which nuance and meaning ins lost highlighted the danger of wholesale theft. Meanwhile, the risk of pastiche that comes from sampling without deliberation and intent (eg: Justin Bieber making Dancehall vs Rihanna making Dancehall) can lead to meaningless work that asks no questions and serves no purpose. For educators, the lesson is clear: we must know where our assumptions and ideologies come from, because chances are they are rooted in sources of old. When done properly, sampling can bring an idea back into relevance or celebrate the original, confirming its worth in a contemporary context. Remixing is celebratory and disrespectful in equal measure, but deliberate remix and sample work is rooted in integrity. How can we have integrity of we don’t interrogate the roots of our ideals, values and assumptions? There were no easy answers or clean solutions to the ethos of sampling, and as you can see from my ramblings above, we really did dance across modern history. Debates raged on whether or not and why Kanye West might have sampled ‘Strange Fruit’ to riff on his personal tribulations and relationship issues, and consensus was not reached. But that’s the point. Sampling and intertextual play is an invitation to friction, where context bubbles to the surface in the debate over artistic intent and ideological integrity. Maybe it’s because I haven’t shied away from my interest in Hiphop, maybe it’s because I’m black, maybe it’s because he’s found my youtube channel, but there’s this kid in my GCSE class who keeps challenging me to a rap battle. It’s sweet really; he finds me in corridors, smiling inanely (him, not me) and starts calling me out with half formed lyrics, almost entirely borrowed from youtube views. I keep telling him it won’t happen. Mainly because he can’t rap, and my Simon Cowell-esque teacher persona refuses to take him seriously. complete with gun fingers. And then I called him on it. I asked him what he was saying, if he knew what he was saying and if he knew why he was saying it. What was it about shanking someone that he felt was exciting enough to bring to a cheeky rap-against-your-teacher scenario? Which led to a whole-class discussion about whether or not Grime reflects reality or reinforces stereotypes. And then we watched the lyric video to ‘Castles’, discussing tensions between society’s view of the young black male and the actual societal pressures faced by young black males. Which, as it turned out, was a conversation of especial relevance to non-black members of the class, inasfar as they were forced to challenge their own perceptions of blackness. I asked them who ‘Boris’ is. They correctly identified the reference to London Mayor, Boris Johnson. I asked them who ‘Boris’ represents. They said they weren’t sure (my fault for asking a closed question). So I drew their attention to a few scribbled notes from the previous lesson, during which we had discussed the concept of marginalisation. Look carefully at top right. That’s a list we came up with of all the things that the most privileged members of UK society are, the criteria that places them at the centre of mainstream society. We went through each point in turn and asked if they apply to Boris Johnson. Then we did the same with reference to David Cameron. Then we discussed what it means for someone to not satisfy any of that criteria. which none of them had seen. They immediately clocked Boris Johnson and David Cameron and started questioning how it could be that such a small circle of friends could end up in such positions of social privilege and political influence. and asked them what the difference is between a group of MCs who are heavily influencing the mindset of an urban generation and a group of public-school educated Oxbridge alumni who are heavily influencing the country. 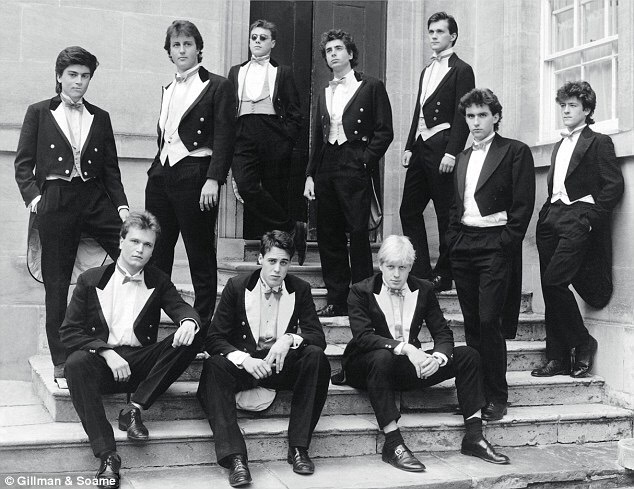 Which led us back onto the topic of marginalisation and social disenfranchisement, namely questions of how the socially disenfranchised respond to social inequalities, as highlighted by the Bullingdon photo. Which in turn prompted me to turn our attentions towards the video to ‘ill Manors’ by Plan B. It turned out that this is a very inclusive slice of anti-establishment class-based protest music, in that it features a full complement of marginalised peoples from a social spectrum; people of colour, people living in conditions of deprivation, criminals and would-be criminals, girls, boys, women, men, even an elderly woman in a wheelchair. My students, at this point were gripped in debate. Some of the girls were firing home truths to some of the boys about their fascination with only the worst aspects of black culture. And some of them were realising, seemingly for the first time, that music videos are hyper-stylised representations, as opposed to accurate depictions of real-life. a song about the exciting and dangerous urban ‘jungle’ that is East London. With the new perspective offered by our conversation, the class were sharply critical of the representation of young, black men as Morlock-esque urban miscreants, full of nocturnal malevolence. We started to ask difficult questions of Professor Green and challenge our own preconceptions of ‘black boys’ as well as the wider presentation of black youth in pop culture. 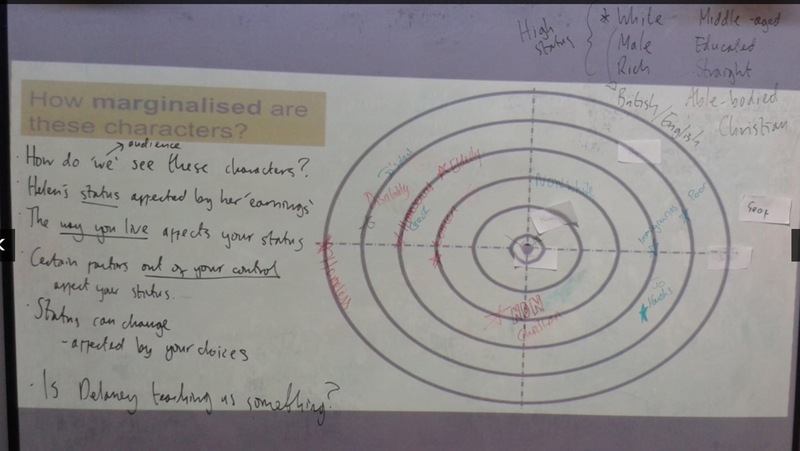 In retrospect, this entire lesson (which was a complete derail from what I had planned) was a focussed exploration of three very important concepts: Representation, Marginalisation and Disenfranchisement. All three of these concepts are of crucial importance to the experiences of young people, but they don’t readily find a place in mainstream curriculum. Since exploring Hiphoped in practice in my own pedagogy, I have found that most kids are itching to discuss the various intersections between popular culture (that they feel ownership of) and dominant social paradigms (that they are subject to). All of this demands an interrogation of the modern curriculum. Shortly after this experience, I found myself steering a year 9 unit of work on ‘Survival’ into a study of modern London and the tensions of multiculturalism, during which we examined and compared texts (literature, songs, music videos, poems) by Zadie Smith, Dizzee Rascal, Doc Brown, Sway, Plan B, William Blake and Charles Dickens. Along the way, we also studied a selection of newspaper articles and opinion pieces from the Telegraph and the Guardian, branching off into issues if Higher Education and the realities of studying in London. I’m wondering now why I didn’t explicitly introduce the concepts of Representation, Marginalisation and Disenfranchisement to this class and think that next year, it might be a good idea to build the Bullingdon Club/ Boy Better Know Debate into their year 10 curriculum. 1) Many of the essays produced by my students found new intersections between texts, starting conversations rather than confirming established conclusions. 2) This was the first time that my students had seriously discussed writers and artists of colour regarding issues that affect people of colour. In light of a decidedly white curriculum, this is not only significant, but an alarming reminder of the lack of diversity in the usual curriculum. As ever, something to think about. Note: If you’re interested in further details of the units of work mentioned here, drop me a line in the comments. Always happy to talk. This blog post has a soundtrack. Click this link in a new tab and read on. Right. So for reasons only the timetable gods will ever really appreciate, I recently found myself having to cover a merged set of year 8 classes, including only a small handful of kids from my actual class, who have been studying ‘Conflict’ over the past few weeks. We’d recently been exploring the concept of being at conflict with a place (namely London), examining George the Poet’s ‘My City’. I wanted to go further by studying ‘Sittin Here’, the opening track off Dizzee Rascal’s first album, Boy in da Corner. So I get the music playing and present a selection of words from the song, excitedly telling the kids that we’re going to have a cypher. Which they were. 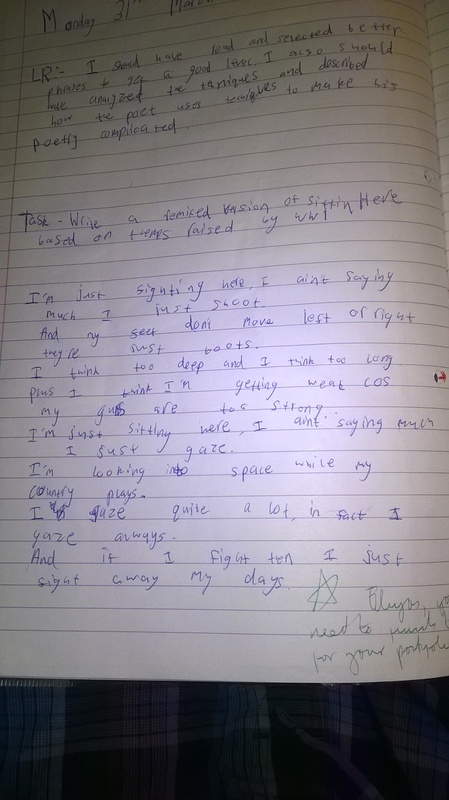 Admittedly, I hadn’t really set up the situation probably and the prospect of rapping freestyle in a group of peers is pretty daunting for even the most year 8-ish year 8 mind. Of course, we got off to a slow, halting start and the kids didn’t do much beyond huddle in groups/ cling to tables/ stare wide-eyed at me/ shrink into themselves like prodded snails/ delete as appropriate. To be fair though, there was a palpable sense of excitement slash fear in the air, which transformed into positive energy once I got them all to chant a shared chorus. “Let me think… Let me THINK… Let me THINK (About what!) LET ME THINK!” etc. Despite having seven years of teaching behind me I was learning, all over again, about group dynamics, as if for the first time. Naturally, I had to rap first to break the ice, and delivered an iceberg-shattering verse that the kids seemed to like, punctuated by whoops, repeated rhyming words and hype-man-esque dance moves. We were warmed up. At that point, I lowered the volume and let the kids start writing lyrics of their own (note: it was amazing how quickly they found something to write on and with, with absolutely no heel dragging. Hiphoped: Bringing Children, to Life ™). Feel free to lower the volume on the other tab yourself. Now, this isn’t a blog post about the magical powers of Hiphop to appeal to modern youth. I’ve written than one already. It’s about Black History. And black culture. See, I’ve spent the past four days wrestling with a blog about the perils of that thing we lazily call ‘cultural capital’ in modern education, linking it to something known as Aggression Theory. Please google it. That particular blog will probably never see the light of day because I just can’t reconcile my ideas properly, but this little anecdote I’m spinning offers a measure of clarity. As the year 8s thawed and started sharing their verses, I was struck by how well-versed they were in the norms of Grime and Hiphop. Irrespective of gender, colour, creed, height, academic ability and eye colour they knew what was appropriate and what was expected. They knew which idiolect to adopt and which references to drop. To varying extents, they shared a tangible cultural capital of ‘black’ culture. The problem was/ is/ might be they don’t fully appreciate the nuances of the culture they have adopted as their own. I’ve said in previous posts that there is an allure to the illicit nature of urban music that will always appeal to the adolescent mind. But there is so much more going on that many kids, through no fault of their own, do not see, let alone appreciate. 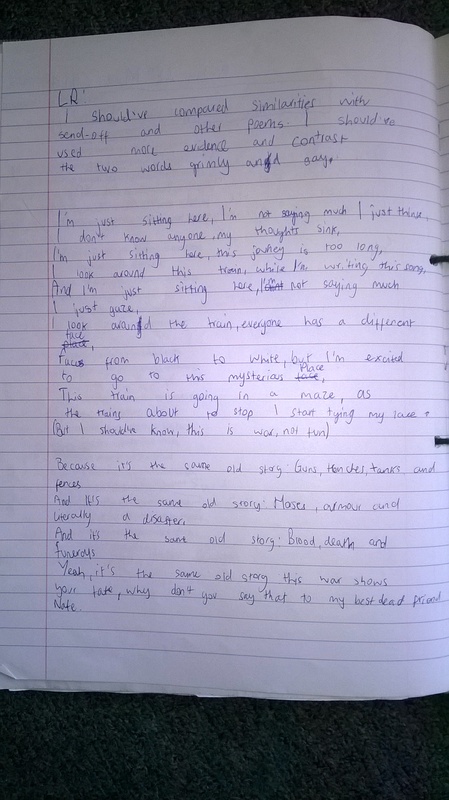 I talked to the year 8s about their lyrics (often violent, always boastful, littered with references to money, sometimes playful) and they hadn’t considered why they leant towards some subjects over others. Only one student (interestingly enough, an ‘at risk’ black boy with a history of school suspension) wrote about something really profound, talking about “this place called prison/ that you don’t want to live in”, with references to young children wielding knives in the streets. They laughed with incredulity when I described looping the breaks on funk records to create a party (“what’s a record?”) and furrowed their brows when I suggested that some of them had written lyrics of protest. And when I asked who they wanted to listen to, it was a top five rundown of the latest youtube stars, rather than a considered list of interesting or arresting artists. With another Black History Month on the horizon, I’m thinking that I might have a responsibility to offer these kids deeper insights into Black British culture, not because I’m black, but because I appreciate the nuances of that culture. I can see the provenance of various urban genres and their wider socio-economic relevances. I can place myself in a socio-cultural historical context. I’d like to think that I can hold my own in a rave just as much as in a debate about UK race relations in the 21st century. And if we’re serious about giving kids a cultural capital that means anything, perhaps we should offer them opportunities for similar understanding of their selves. Definitely something to think about. So I’m drifting round my first year 10 lesson of the Autumn term and I hear one of my students rapping away to himself. My ears tune in and I realise it’s the hook from ‘Shutdown’ by UK Grime MC, Skepta. One of my students, a young Bengali boy, is quietly rapping away to himself while underlining the date and title. Jokingly, I tell him that he’s going to need to put more bass in his voice if he’s going to pull that off. His response? Widened eyes and dropped jaw. 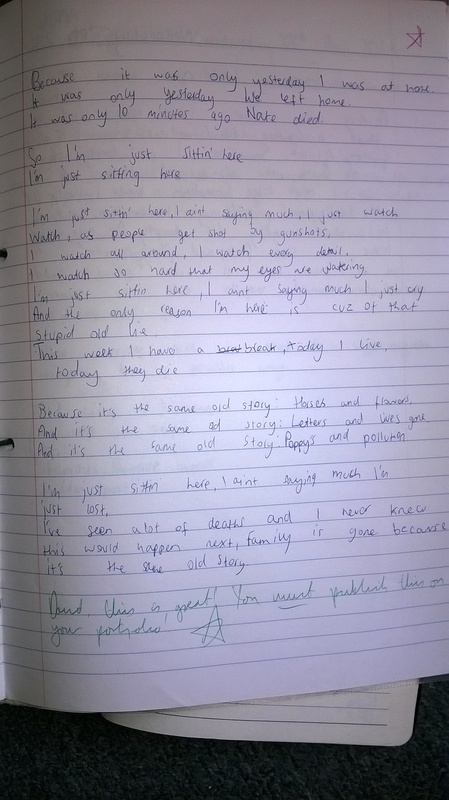 For some reason, this student (and the other kids on his table) found it utterly unbelievable that I would even be aware of, let alone appreciate the music, life and times of Skepta. They were bemused and incredulous all at once and to be honest, I don’t think they really believed me anyway. I have tracked his career from the earliest days of Lord of the Mics. I have bought his music and scrutinised his lyrics. I have discussed the socio-cultural resonances of his work with academics. I have shouted his lyrics in my car whilst driving through the streets of East London. And yet a scrawny teenager of Bengali heritage feels more entitled to claiming kin than I do. Three theories immediately spring to mind as to what’s going on. Carlton aside, somewhere in the middle of these theories dance the deciding factors of context and identity. In previous posts I have explored the intersection between persona and identity, suggesting that teachers find themselves snared between crafted and appointed personalities, sometimes at conflict. Skepta-gate, as it shall be referred to from this point on, throws this conflict sharply into light. Why should my teacherness be an obstruction to my other identities? Why can’t my students reconcile my role as a teacher with the possibility that I may be other things? That I may be from the same social universe as their idols? What is it about the establishment that brings the gears of identity grinding to collapse? And who exactly are my students seeing when they see me? Someone like them with a shared appreciation of marginalised cultures, or someone who is so ingrained in the systems of education that he couldn’t possibly understand where they are coming from? I find this worrying. One of the underpinning philosophies of Hiphoped as a critical pedagogy is that it seeks to offer a space of reconciliation for various identities. 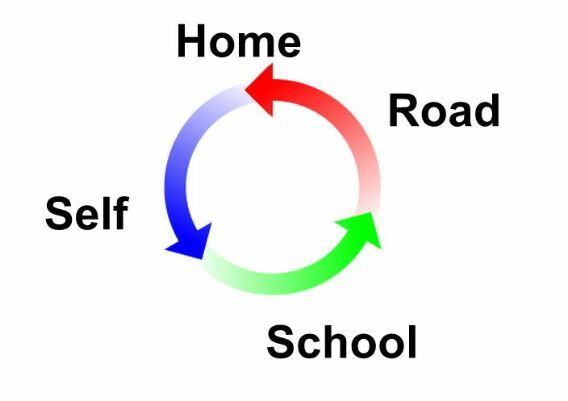 In the past, we’ve talked of the languages of Road – Home – School as being disparate, forcing students to code-switch and slalom. When I think about it, a similar pressure is exerted upon teachers, especially teachers who fall out of mainstream norms. Not to overstate the case, but isn’t it weird that a young, black, urban teacher is seen, by students, as alien from black, urban youth culture? A cynical but valid argument is that capital E Education is a straitjacket on identity. The idiosyncratic peaks of an individual who becomes a teacher are bulldozed flat by the profession itself. Alarmingly, my students might look at me and see not a person with the potential for personality like any other, but a simple manifestation of an established system. The upshot of this is that teachers may find themselves struggling to forge meaningful relationships with their students if the teacher persona is indeed as restrictive as I’m suggesting. And any efforts to reach out and bridge this gap are fighting against a tide of socially and culturally ingrained ideals. When I think about it, this is perhaps a central tension that runs through Hiphoped, or any pedagogy that seeks to meet the kids where they are. Kids aren’t of the establishment, teachers are. End of. It’s no wonder that my anti-establishment claims (ie: liking Grime music) would be met with instant incredulity. Interestingly, Skepta himself explores the tensions between identity and establishment in the song ‘Castles’ from his 2014 album ‘Blacklisted’. The song (analysed and discussed here by Hiphop Educator/ Academic Darren Chetty and UK rapper Ty – well worth a listen) outlines a young black male’s movement through a system of distrust. He reflects on failing at school (being labelled a ‘sideman’ by teachers), being distrusted by shop security guards, potentially ending up a ‘statistic’ to his racial profile, empathising with the London rioters of 2011, gun crime in urban environments, and the futility of casual drug use (smoking a ‘stupid zoot’). In this, the disconnect between society at large and societal expectations of the young black male prevent Skepta from relaxing into his successes. Yes, he is invited ‘to talk to the kids at assembly’, but his success as a musician is shackled by ongoing social stereotyping. Ironically, I find myself in the inverse position, whereby the students I teach might distrust my authenticity because of my professional persona (linked to stereotypes of what a teacher is), while the system I teach in fully welcomes my teacherness. 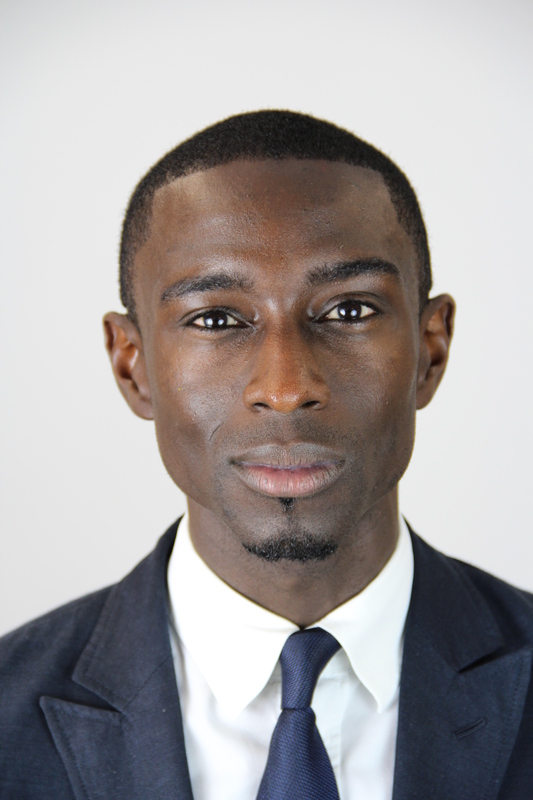 As long as I look, act and sound like what a teacher is supposed to look, act and sound like, I can’t possibly be as ‘real’ as is expected of a young black male. In the eyes of my year 10s, a teacher can’t be as real as Skepta, hence the incongruity of my knowing about Skepta in the first place. Ultimately, this leaves an anvil-like question mark dangling precariously over the flimsy box construction that is identity. Should I shrug and accept my fate as a teacher destined to culturally be at arm’s length from my students? 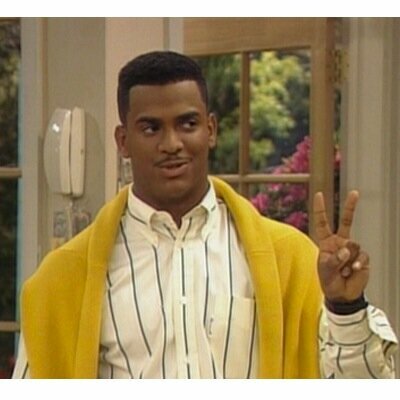 Or do I fight to make my authenticity/ realness/ social identity/ delete as appropriate known? No easy answers, but, as ever, something to think about. Note: A potential problem in all this is the extent to which ‘realness’ is equated with negative social traits, but that’s for another blog post. Much to think about. 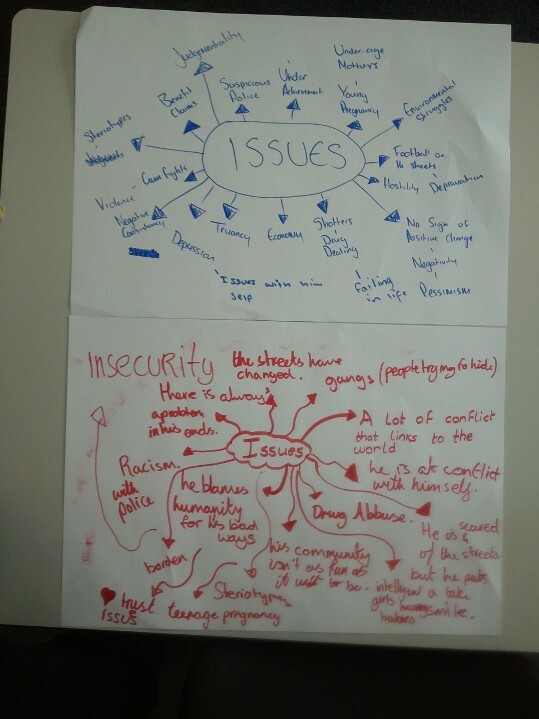 Earlier this year, I took my year 8 tutor group through a Hiphop Ed curriculum, through which we explored the history of Hiphop, cultural resonances worldwide, and various related socio-economic issues including class, Feminism, gender norms, and Capitalism. The project began with a DJ workshop and culminated in a series of essays, each on a question chosen by individual students. During this time we analysed rap lyrics, watched documentary footage, had debates on key issues and even carried out primary research at a local shopping centre. They then had to take their essays and flip them into five-minute ‘Ignite’ speeches, which were delivered in a whole school event. Before this process began I knew my students had an interest in Hiphop. Even the most casual chats about music confirmed what we already know: that Hiphop culture (and its various offshoots) is now the dominant youth culture. This, of course, is by no means a simple cause for celebration. The hyper-capitalist direction mainstream Hiphop has moved in has almost divorced it from social responsibility, as my class discussed after reading Questlove’s excellent essay series: ‘How Hiphop Failed Black America’. And it is no accident that five of my 13 students chose to focus their essays upon issues surrounding gender and the subjugation of women in modern society. They were ready to interrogate rather than celebrate. Which I found interesting. After the initial novelty of playing with records had waned, it became apparent that for these kids (aged 12/ 13) very much saw the Hiphop I presented to them as something historic. Their expertise and relatedness to the culture as they understand it is tied, inextricably, to the context through which they discovered it. Sounds obvious, but it raises a (much debated) point about not just Hiphop in education but cultural studies overall: to what extent should a student’s experience of a culture steer their exploration of that culture’s ‘official’ history? I felt as though I was giving my class an opportunity to deepen their understanding of a culture that pervades their exploratory adolescent years, but, to be honest, I’m not sure how much they cared. Skip forward a few months to the end of term, and the obligatory classroom party, complete with Doritos, Haribo, party games and youtube playlists. After minor protestations I quickly capitulated and let the kids take the helm. And weren’t the results interesting. First of all, as expected, the playlist was entirely black music, with no exception, again confirming what we already know: that black culture (and its various offshoots) is the dominant youth culture. Slightly more interesting was the provenance of music being chosen. It was about 90% (give or take) British. And almost entirely current. And of this selection, exclusively Grime. I find this telling. My class (predominantly Muslim, about 60% UK-born, speaking a total of 11 different languages, spanning Eastern Europe, Asia, West and North Africa) are in firm agreement that the hottest music out is Grime music. With unfettered access to the latest hits via youtube, these nascent adolescents seem to be pinning their flags to artists who speak in the language of their streets. I recently read this excellent and inspiring piece on ‘Why I love Grime’ by @okwonga which reminded me what excites me so much about Grime. Its energy, wit, underlying social protest and unashamed Britishness make it a compelling incarnation of UK youth culture. Not to mention the fact that Grime has evolved from a very British heritage (Ragga, Dancehall, Jungle, Garage), harking back to the Windrush diaspora and proliferation of Black Britain via the West African migration of the 1970s. So when I find myself shouting the lyrics to ‘Man Don’t Care’ by JME alongside three or four over-excited 12 year-olds, maybe I’m actually celebrating – black UK music and black UK culture. I teach in London, so it’s not surprising that my students revere Grime, which is a cultural London success story. Their eyes light up with Grime. They love references to a world they can see on the way home from school, spoken in the same language they learn in the playgrounds of their schools. The glitz of American Hiphop seems to be too glitzy, too glamorous, too foreign, too mainstream. Your Kanyes and Jay Zs are of an older generation, music for their parents maybe. And even your Drakes and Big Seans (who the kids love) seem to be a few years stale. While the neo-conscious movement led by your Kendrick Lamars and J Coles just doesn’t seem to register at all. The average UK teenage music fan is looking for something closer to home, and what’s closer to home than Grime? Grime was never supposed to make it into the mainstream; it’s the sound of disaffected youth shouting discontent in shows of lyricism that mean nothing to anyone other than themselves. And yet the culture has born a generation of icons who are part of the establishment, whether the establishment accepts it or not. On this note, the image that introduces this essay is particularly revealing. JME takes the university degree he has and sets it alight in a blazing rejection of societal expectations and mainstream definitions of success. He then proceeds to use this to set fire to the microphone that he has chosen to define him, before rapping a few bars into the flames. It’s a powerful conflation of ideals that ultimately empowers him. He can do what he wants, how he wants, with or without the acceptance of mainstream society. Grime, in its idiosyncratic tunnel vision and ADHD energy levels, is much the same; a symbol of empowered disaffection. So perhaps when we discuss Hiphop Education in the UK we really need to discuss Grime as the embodiment of Hiphop’s basic tenets in this country. Perhaps Grime is the UK’s incarnation of Hiphop, as socially and politically important as any other musical movement. And perhaps we (by which I mean educators) should therefore give it the respect it’s already earned from today’s youth. Something to think about. Hiphoped is a critical thing. How can hiphop help decolonise the imagination? What does hiphop mean for modern young people? What is the relevance of hiphop, today? What is hiphop’s relationship to modern pop culture? How has hiphop influenced youth culture? What can hiphop teach us about creativity and innovation? Why is hiphop still relevant? Who or what is hiphop? Has hiphop caused more problems than it has solved? Has hiphop solved more problems than it has caused? Has hiphop brought the world together? How can hiphop teach us to be entrepreneurs without necessarily becoming entertainers? Hiphop glamorises violence and prejudice. Discuss. Which of the hiphop elements is translated best internationally? Do different groups/ generations have a different idea of what hiphop is? How has graffiti and street art changed ideas of art? How has street dance changed ideas of dance? What role does hiphop have to play in the Civil Rights movement? How can hiphop help us find a realistic and impactful way of dealing with gangs, cliques and bullies? Can hiphop fit in with the establishment? Should it? To what extent can hiphop promote a feminist agenda? Does hiphop promote negative stereotypes or can it work to promote a positive social agenda? If hiphop started out as representative of black culture, what set of experiences does it offer white listeners? Is hiphop a social change movement? Is hiphop still an effective means to reach female youth? Is hiphop a limiting depiction of Black cultural expression? Is the market driven form of hiphop not really hiphop at all, in historical terms? Why aren’t there any visible protest/ social activist raps for the current zeitgeist? What is the connection between living environment and hiphop? 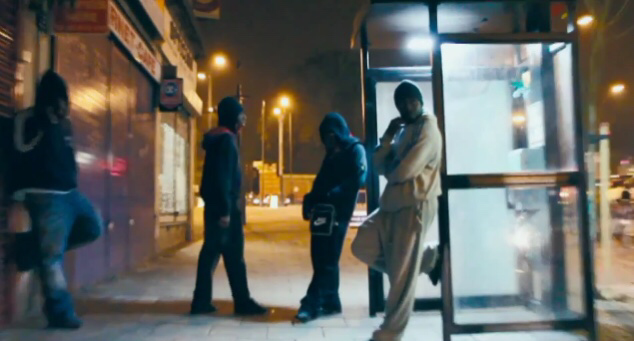 What has been the effect of hiphop in London? Does hiphop prove that pop culture is fuelled by money? Why is hiphop the dominant youth culture? Is hiphop just a label for modern youth culture? It’s a long established hiphop staple for artists to have special guest feature artists on their tracks. Mixtapes and albums are full of bracketed (feat.) additions, filling tracklistings with a who’s who of genre stars. I’ve always liked this – it promotes collaboration in an otherwise highly competitive arena, allows for healthy competition within songs, adds texture to a mixtape or album and gives artists a chance to shine in controlled doses. A featured artist can also raise the profile of a song significantly. It’s an old trick for up and coming artists to feature a more established rapper in a bid to validate their music. We’ve even seen Kanye West and Jay Z ‘feature’ Otis Redding on ‘Otis’ despite the fact he died in 1967. There’s something in this that can apply to teaching. He invited me to sit down and join in. So I did. In a sense, I had been the featured teacher in that lesson. 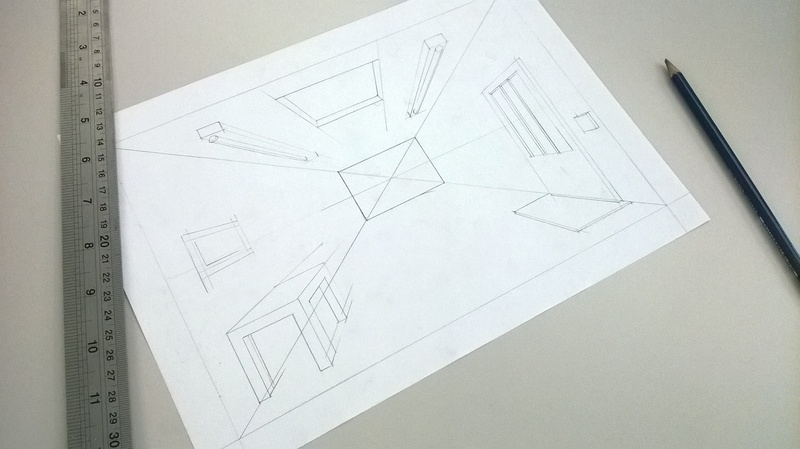 it wasn’t an observation, or ‘learning walk’, or pupil pursuit, or TA session; it was a casual interaction with someone else’s lesson in which I could reflect on pedagogy and interaxct with students in a different curricular context. Have you ever featured in a colleague’s lesson? Anecdotes welcome. I used to DJ quite a lot. It got me into music, scratching, hiphop and ultimately, teaching. Well, not quite, but it got me into rapping. And I rap about teaching. Anyway, I’ve always thought that the psychology of DJing is something to be considered by anyone who has to interact with large groups of people. DJing is an art, yes, but it’s also a kind of public service. So, in my current incarnation as a public serving teacher of young minds, it makes sense to consider what we, as teachers, can learn from the DJ. Presenting, the Top 10 Things Teachers Can Learn From DJs. Insert duvva duvva pullback sound. Nothing is as irritating as the DJ who plays for himself. Part of the real skill of DJing is being able to read a crowd and work out what will get them on the dancefloor. I remember playing a party with crates of hiphop records in tow, but the crowd were into party pop, so I had to improvise. I ended up raiding an old record collection for some 80s pop compilations and jacking in my ipod for some dance. The same logic must apply to teaching. The teacher shouldn’t pander to a class, but it is imperative that we appeal to their preferences and tastes. This is where the Relatedness strand of Self Determination theory comes into its own. Feed off the energy off the crowd, don’t self obsess and make their fun, your fun. For anyone out there who doesn’t know what a vinyl record is, crates refers to the crates a DJ would carry their records in, back in ‘the day’. Anyway, the good DJ MUST have a detailed working knowledge of a lot of music, not least of all the music he actually owns. you’v got to be mercurial in knowing what goes with what, what should follow who, how to start a set, bpms, locations of songs on albums, etc etc. In teaching, same thing. Some people call it a ‘toolkit’, some call it ‘experience’. Either way, that working knowledge of your own practice is the difference between a busy dancefloor and a dimly lit wasteland. A good DJ has to listen, carefully, to everything. In fact, the good DJ has to listen to many different things at the same time, make sense of it, and create something harmonious out of audio chaos. Beat-matching involves queuing up one song in headphones whilst another song plays out to the crowd, which forces you to single out a rhythm in a mess of pulses. A good teacher has to do the exact same thing: make sense of a disparate collection of individuals working at different tempos and synthesise it into a classroom experience. This takes skill, patience and an ‘ear’ for music. Furthermore, we need to hear the political mood music and negotiate it all, be it changes to assessment, local authority structures or government educational policy. Don’t jar. Songs should mix and blend into one another seamlessly, so that the crowd doesn’t even realise they’re still dancing despite a change in song/ artist/ tempo/ etc. Teaching should be equally smooth, with topics and units eliding into each other. I did this particularly successfully with a unit of work on World War 1 which I merged into a unit on London, via Dizzee Rascal and the theme of conflict. 5. Be aware of pace! Peaks and troughs, people, peaks and troughs. 180bpm electro for 4 hours straight WILL clear the dancefloor. ‘Right then!” Do Nows and continual 5 minute blasts of learning WILL exhaust your students. Mix it up. Ofsted recently announced that they are no longer grading lessons. Which, I feel, is a huge step forward. 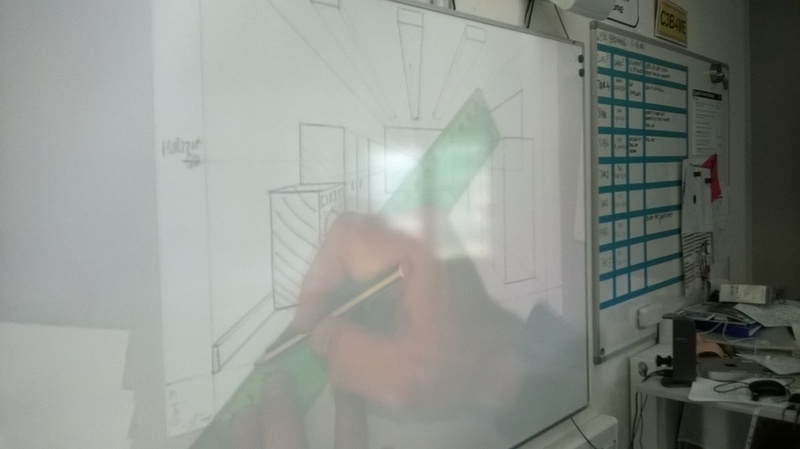 Recently, I underwent an Ofsted inspection during which the inspector came into my room, and we chatted to and with kids for 20 minutes, while the class got on with a project based essay. In comparison to a few years ago, during an Ofsted inspection where I ‘performed’ at the front of the class, this was a breath of fresh, cliched, air. Despite the rise of the ‘superstar’ DJ, I firmly believe that the DJ is best left as a party technician, quietly working magic for the benefit of others. Teachers, similarly, should be a quiet force of change in the lives of their students. Besides, most of what we do happens outside of the stage of the classroom, in planning, assessment, curriculum design and so on. The simple truth is that selection is everything. Play it on what you can. Teaching, I feel can learn from this – pen and paper, Harness debates, ICT projects, booklets and worksheets: all different routes to the same goal. Party on. I once DJd a party fuelled by nothing other than cups of tea and words of encouragement. While the revellers revelled on, I stayed calm and cool, doing my job. Teachers, take note: Keep sober, sleep right, eat well and look after yourself. The party ends when the music stops. The learning ends when the teacher drops. 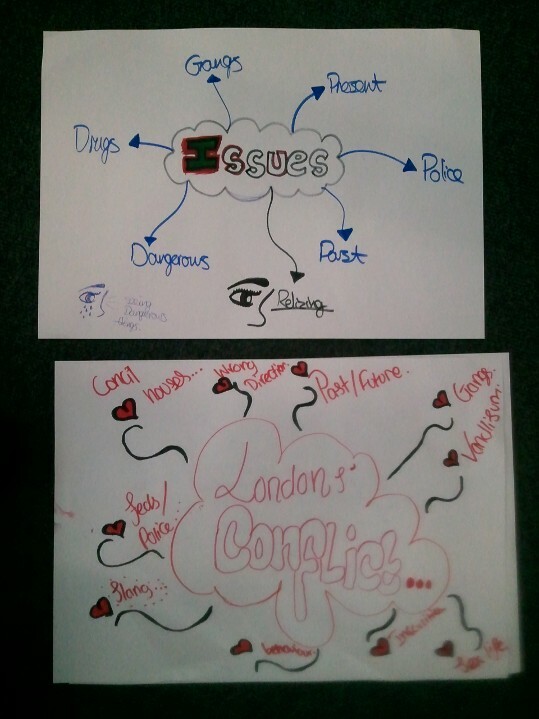 So I recently embarked upon a unit of work with my year 8s on the general theme of London, exploring a range of texts and authors throughout history, connected to this great city in which I live. 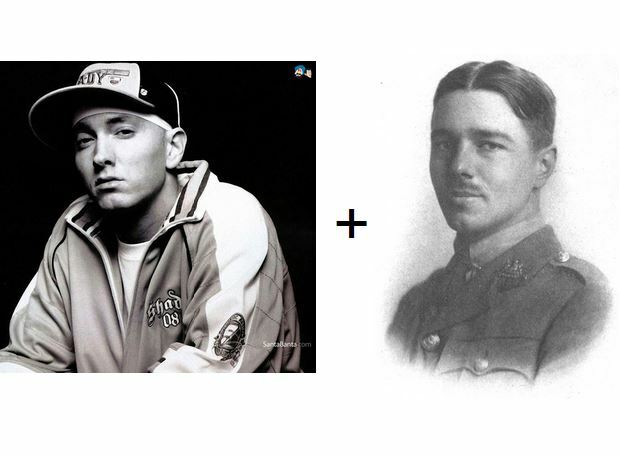 The unit came immediately after a scheme of work on World War 1 ‘conflict poetry, during which, among other things, we explored some pretty compelling links between Wilfred Owen and Eminem. We started by listening to the first track off ‘Boy in da Corner’, entitled ‘Sittin Here’, in which Dizzee reflects on life growing up in a hostile city. It was great fun to let the kids take over on vocabulary-busting duties. They ALL knew all the slang terms, even those that I thought might be slightly outdated in 2014 (11 years after Dizzee released the album). Goes to show, offer ownership to students and they’ll meet it on their own terms. Anyway, let me get to the interesting bit. 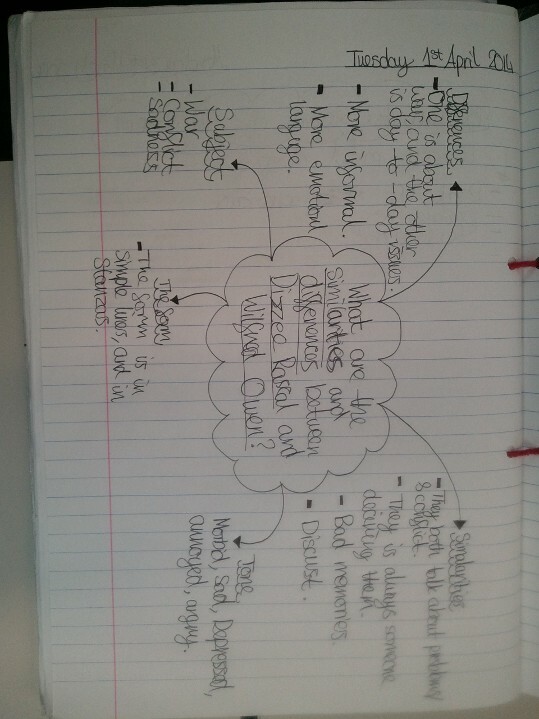 After analysing Dizzee’s lyrics and debating the extent to which he was at conflict with London, I offered up a selection of creative and analytical tasks, ranging from self-generated essays to creative writing challenges based on Dizzee’s lyrics. 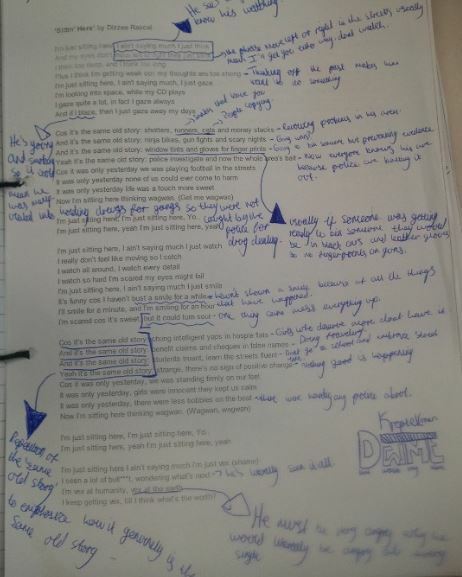 One of the tasks was to write a remix of ‘Sittin Here’ from the perspective of Wilfred Owen, riffing on themes we explored in the Conflict unit. Now, this may seem like a tenuous link, but check this out. Impressed? No? Let me explain. Above are two recently unearthed examples of #hiphoped in action, hence this blog post. 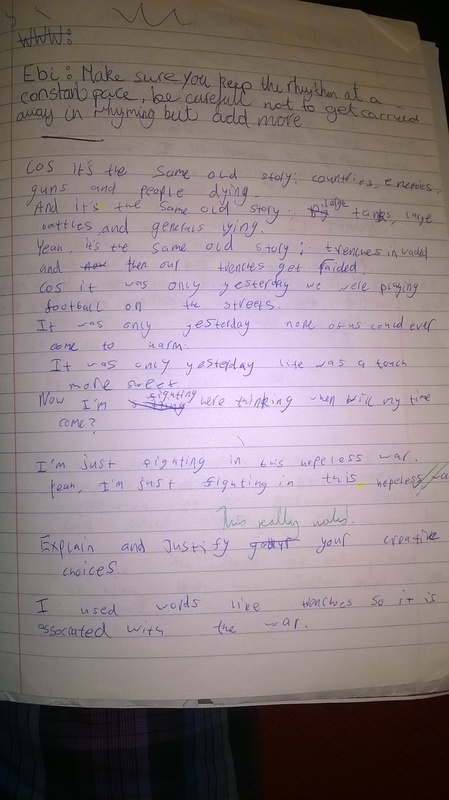 You can’t read it, but these two students took all the learning from the Wilfred Owen poems we studied and synthesised them into original reworkings of Dizzee’s lyrics. I have written in the past on the potency of sample culture, but it never ceases to amaze me just how powerful hiphop pedagogy can be, in practical application. 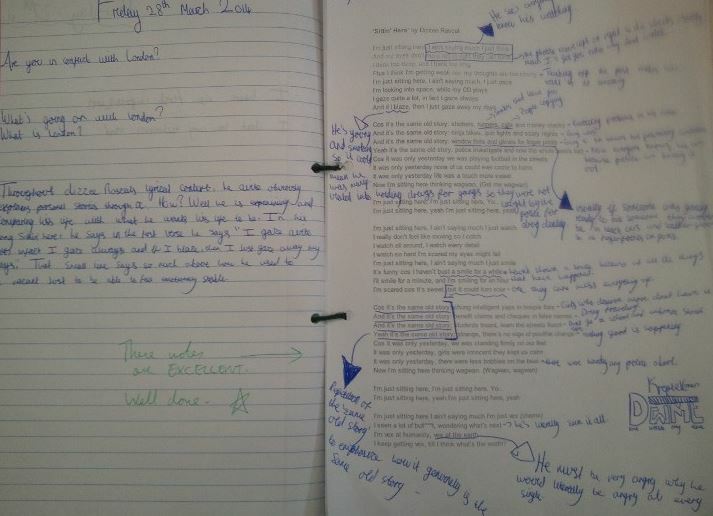 Unprompted, these students poured their appreciation of Owen’s poetry, their understanding of modern, urban London and their appreciation of hiphop lyricism into a creative exercise rooted in academic rigour. Below are transcripts of the remixed texts. Look out for cleverly interwoven WW1 references. And click the ‘Sittin Here’ instrumental to sing along, if you’d like. Plus I think I’m getting weak, cos my guns are too strong. I’m just sitting here, I ain’t saying much, I just gaze. Now I’m fighting here thinking when will my time come? Yeah it’s the same old story: this war shows your fate, why don’t you say that to my best friend’s face. I watch so hard that my eyes are watering. Side note: I also created a class page of ‘Sittin Here’ on my Rap Genius profile, which one student took great pains annotating, as her preferred task. That’s it for now. Exploration in hiphoped continue apace. Soon, I’ll be tidying these resources up and making them available for teachers. 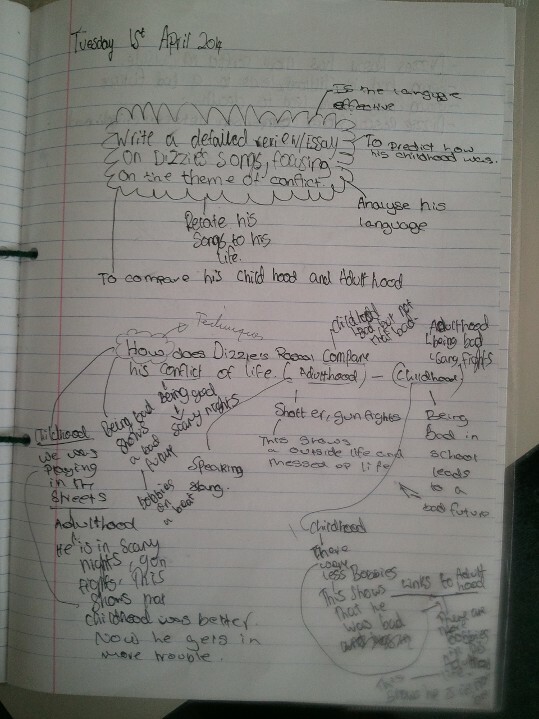 So I’ve been studying conflict poetry with my year 8s this half term. Because they’re doing a project on WW1 across Humanities and Art, I decided to let the unit sprawl into WW1 poetry. 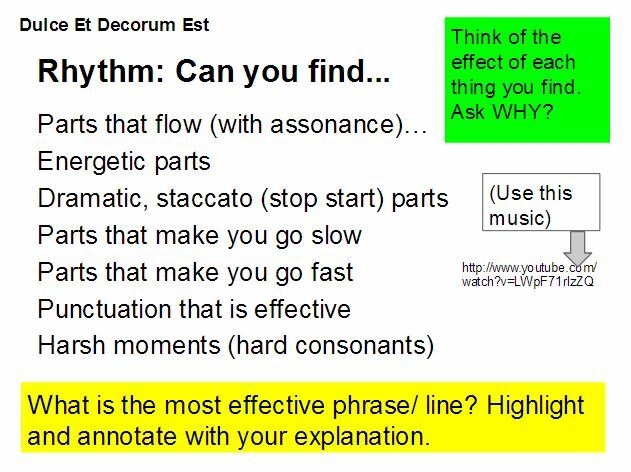 All fairly standard fare to begin with – until, of course, I found myself listening to Eminem on youtube while planning a lesson on Wilfred Owen’s ‘Dulce Et Decorum Est’. Who would’ve known that you can read Dulce, perfectly in rhythm, alongside the instrumental for ‘Like Toy Soldiers’? Because you can. A few powerpoint slides later, that was the basis of the next lesson. It was cool to have this as an entry into the poem, getting the kids to just make it flow before wrestling with language, form and meaning. And, of course, starting with rhythm led to some compelling early conclusions as to the form, language and meaning of the poem, which, in turn, gave the kids a sharp sense of ownership. A few lessons pass and we get into the swing of things with Owen, a timed essay comes and goes and we wind down in preparation for the next unit on London. Are you at conflict with LONDON? 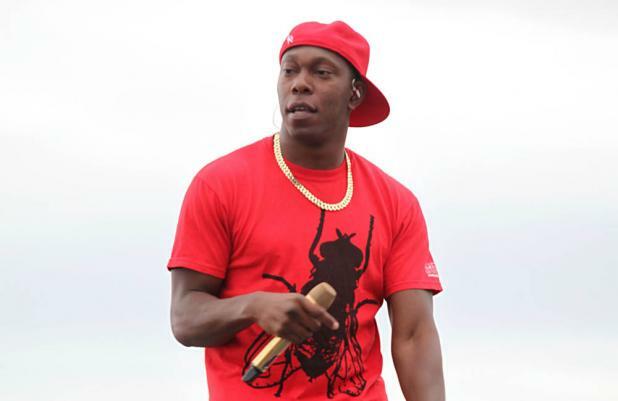 I teach in East London, so it was an easy flip to introduce Dizzee ‘E3’ Rascal into the mix. I played the instrumental to the opening track off ‘Boy In Da Corner’ (‘Sittin Here’) and distributed lyric sheets to the kids. Task 1: how many problems/ conflicts can you spot? The results were scintillating. Even as a card-carrying convert to hiphop pedagogy, I was taken aback by the engagement and relevance this had to these year 8 Londoners. The conversation started with some notes, and ballooned into a full and rich debate as to the subjects and subtexts being explored by Dizzee. As a footnote to this little anecdote, it’s worth noting that I’d recently had a pretty major blow-out with one kid in my class, which we hadn’t quite patched up yet. It had reached a bad place, sort of, whereby I wasn’t really engaging with him beyond a strictly functional basis. This, in effect, meant him coming into my classroom in a huff, refusing to do much by way of thinking, and essentially seeking to show me how disinterested he was in the whole deal. Likewise, I had a pretty crap strategy up my sleeve of sending him outside to do some drudgery exercise book work, if he refused to engage. Messy stuff, this teaching business. Moral of the story?Every now and again, the classroom can be a context that reconciles those three otherwise disparate identities of the Road, Home and School. Hiphoped, can implicitly pull these strands together, and it can be fun to explicitly use hiphop as a hook for doing so.